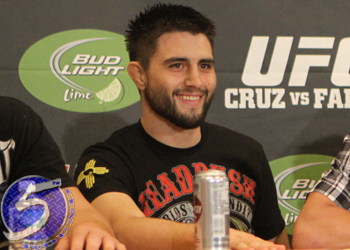 Carlos Condit (Pictured) found himself on the short end of the welterweight stick when Nick Diaz leapfrogged him for a shot at champion Georges St-Pierre. Although Condit was disappointed to lose his place in line, despite doing nothing wrong to receive the demotion, things have ultimately fallen into place now that GSP has unexpectedly exited stage left. “The Natural Born Killer” was preparing to meet Josh Koscheck at UFC 143, but made the no-brainer decision to accept an interim title bout against Diaz when St-Pierre revealed he would have to withdraw from his scrap against Mr. 209 to undergo knee surgery. Fortunately for Condit, his training camp was primarily in the fine-tuning and conditioning stages and hadn’t really entered into the strategy phase yet. “Another change of opponents,” Condit stated. “It’s been kind of a crazy ride the last couple of months, but you just kind of got to roll with it. Condit was scheduled to face GSP at UFC 137, but the French-Canadian was forced out at the last-minute with knee and hamstring injuries. Although the shootout never came to fruition, Condit still has the division’s G.O.A.T in his sights. “I’m really excited, I’ve been wanting to step inside the Octagon with Nick Diaz for a really long time,” Condit admitted. “[He’s a] great fighter, great skill set and I really think we’re going to put on a good show for the fans.